Belgium is a rather small country that is famous for its beers, its fries, or its Manneken Pis, but the country is mostly known all over the world for one thing: waffles! 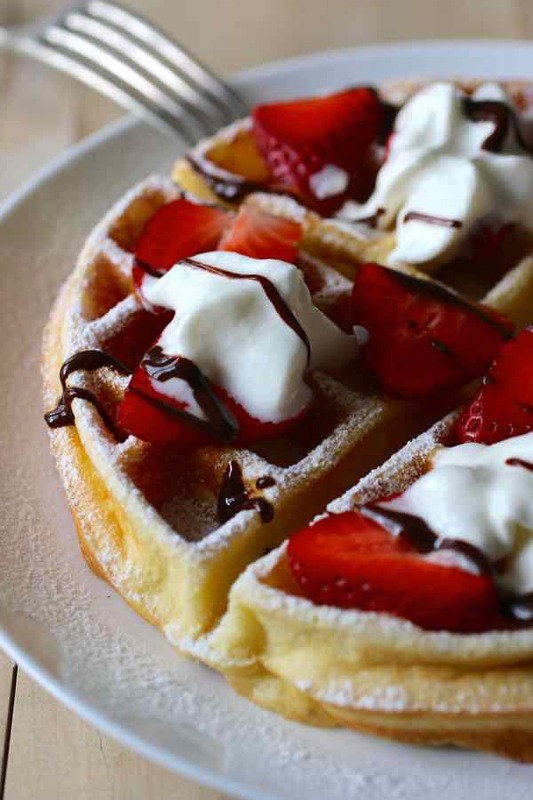 Although waffles are mostly sold by street vendors at fairs and carnivals in Belgium, they are now enjoyed all over world, whether for breakfast or dinner, in sweet or savory versions, at home or outside. A waffle is a small crisp batter cake, that is traditionally baked between two iron plates with various patterns. 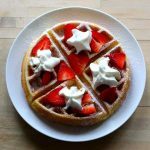 It is hard to imagine a waffle without its emblematic honeycombed pattern, but this pattern is rather new in the history of waffles as these Belgian staples started as flat cakes pressed between two iron griddles. But when exactly were those waffles created? You can go as far back as the Neolithic Age (6000 B.C.E. to 2000 B.C.E.) to find the ancestors of waffles emerge as a hotcake prepared with cereal pulps, and baked on heated stones. The Iron Age (1200 to 550 B.C.E.) saw the advent of iron tools, and therefore iron griddles. It is during this time that the idea of baking bread between two iron plates took shape. It helped speed up the cooking process. But this is really during Ancient Greece (1100 B.C.E. to 146 B.C.E.) that the ancestors of waffles were invented. At that time, the Greeks started baking flat cakes between two hot metal plates. They called these savory flat cakes obleios, and they were mostly prepared with cheese and herbs. Fast forward to the early Middle Ages. It is around 9th centuries that Western Europe saw the emergence of fer à hosties (communion wafer irons also called hostieijzers) as well as moule à oublies (wafer irons). Both iron griddles typically depicted imagery of Jesus or Biblical scenes. The oublie, just like the communion wafer, was prepared only with grain flour and water. Honey and other flavorings were sometimes added, although it is only after the 11th century and the return of Crusaders with new products, that additional ingredients such as orange blossom water were added to the oublies. It is in the 13th Century that the oublie became the waffle, with the characteristic honeycomb pattern that we know of today. It is also at that time that the word gaufre, from the Old French for waffle (wafla), first appeared in print. It is interesting to note that the word wafla means “a segment of honeybee hive”. The first record of a waffle recipe dates from the 14th century. This recipe, which didn’t contain any leavening agent can be found in an anonymous manuscript called Le Ménagier de Paris. It is during the 15th century that the oublie and the waffle started to evolve the new rectangular shape started to define what was going to become the waffle as we know it, although the honeycomb pattern was more shallow at the time. It is between the 16th and 17th century that the first recipe of waffle with a leavening agent (ale yeast) appeared in the Een Antwerps kookboek. 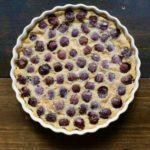 This recipe, called Groote Wafelenof, with its addition of a leavening agent, is the true ancestor of modern waffles. At the time, unsweetened or honey-sweetened non-wheat grain waffles were preferred by ordinary citizens due to the affordable price of these ingredients. Wheat grains and sugar were still quite expensive, and waffles making use of those ingredients were exclusively reserved to the royal courts and bourgeoisie. Around 1620, Dutch waffles arrived to America with the Pilgrims, who were spending time in Holland prior to sailing to America. 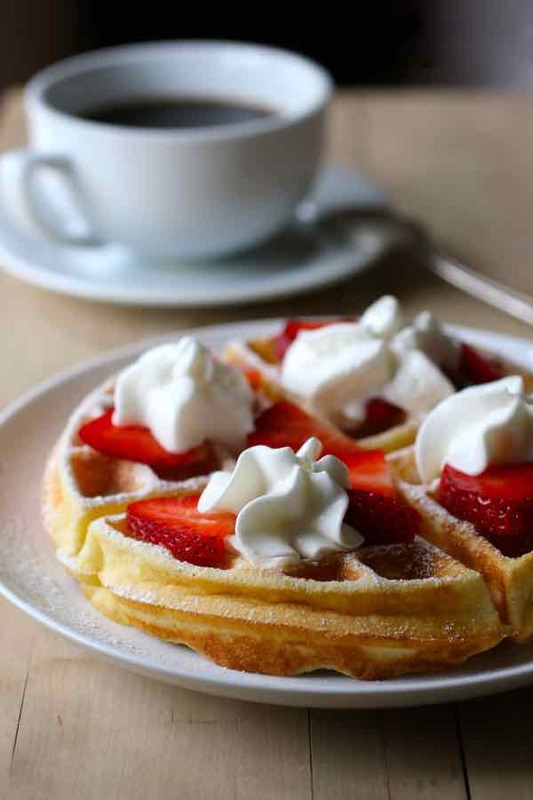 During the 18th century, Germans started to publish a number of waffle recipes, including ingredients such as coffee, cardamom, nutmeg, sugar (zuickerwaffeln) or versions of waffles using Hefeweizen beer yeast. 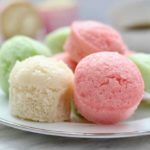 The French also introduced beaten egg whites as a leavening agent replacing yeast, as well as the addition of flavorings such as wine, cloves and lemon zests. It is at that time that word “waffle” first appeared in an English publication. Indeed, the Court Cookery by Robert Smith published in 1725, makes the first use of this word, derived from the Dutch word wafel. In the beginning of the 19th century, “waffle frolics” or waffle parties were the rage in the United States. Waffles were served sweet with maple syrup or molasses, or savory, often topped with kidney stew. Slaves were getting the leftovers, and this is what triggered the creation of a southern favorite: chicken and waffles. The early 1800s also saw the transition from cane to beet sugar, and the dramatic decrease in the price of sugar. By 1813, France had over 300 beet sugar factories, and it became the leading producer of sugar outside the Caribbean and Asia. 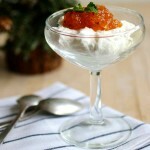 This led to the development of new dessert recipes, in particular waffle recipes. Liège waffles, the most popular modern version of Belgian waffle, were invented around that time by the chef to the prince-bishop of Liège. Liège waffles, which are only available in Belgium, are quite different from the waffles we are accustomed to. 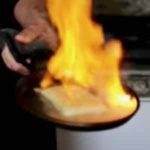 Indeed, instead of a semi-liquid batter, they use a brioche-based dough as well as pearl sugar, which caramelizes on the outside when baked. Liège waffles are richer, denser, sweeter, and chewier than their Brussels counterparts. Plain, vanilla and cinnamon varieties are typically offered by street vendors. It is Antonin Carême, the famous Parisian pastry chef, who was the first to incorporate pearl sugar into the waffle dough, as evidenced in his 1822 work, Le Maitre d’Hotel Français. 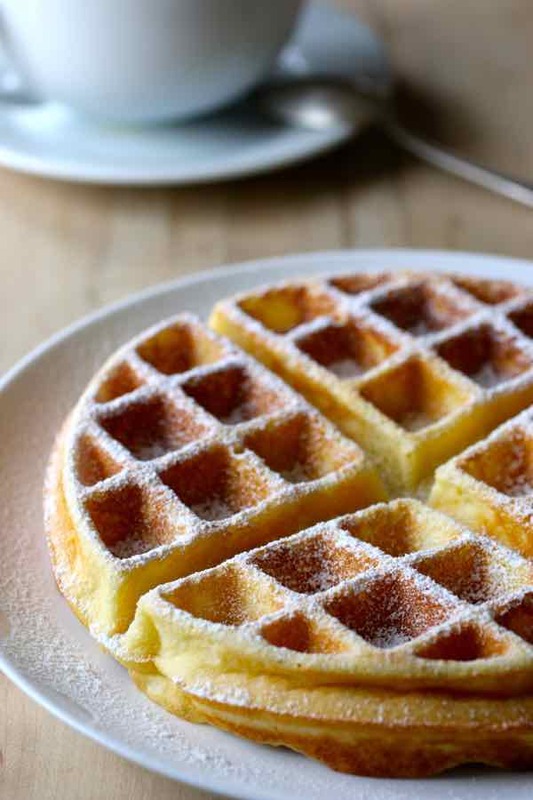 The first record of the Brussels waffle, which is predecessor to the American “Belgian waffle” was published by confectioner Florian Dacher in 1842. Although waffles are now eaten throughout the world, Belgium offers more than a dozen regional varieties beside the Gaufre de Liège and Gaufre de Bruxelles, including the Gaufre de Namur, Gaufre à l’ancienne, Grosse galette liégeoise, Gaufre fine de Herve, Gaufre de Verviers, Gaufre du Perron, Gaufrette Wallonne, Galettes de Tilff and Galettes d’Outre-Meuse. In the 20th century, waffles started to shift from a street-vendor snack to a homemade product, with the 1918 introduction of GE’s first electric commercial waffle maker. Waffle cones for ice cream also debuted at the beginning of the century with an introduction at the 1904 World’s Fair in St. Louis. Belgian-style waffles were showcased at the Brussels World Fair in 1958, as well as the 1962 Seattle World’s Fair, but they really took off in the United States and globally at the 1964 New York World’s Fair. Brussels waffle’s batter is prepared with a egg-whites or yeast. Sometimes, both types of leavening are used in the same recipe. Their shape is most often rectangular, as opposed to the Liege waffle which is round. American waffle, which is also called “Belgian waffle” is generally denser and thinner than the Belgian waffle. The batter often includes baking powder as the leavening agent. In the US, Belgian waffles are often served for breakfast and topped with butter, maple syrup, fruit syrups, honey, or powdered sugar. 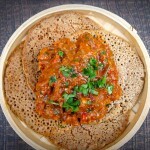 But they are also served in various savory dishes, such as fried chicken and waffles or topped with kidney stew, especially in the Southern states. There are several variations of these waffles across the world, including pandan waffles in Vietnam, potato waffles in the UK and Ireland, Scandinavian style waffles, gofri in Italy (Piedmont), pizzelle, ferratelle, or cancelle, (thin waffle cookies) in central Italy, stroopwafels (thin waffles with a syrup filling) in the Netherlands and Belgium, kempense galetten in Belgium, or even “grid cake” or “grid biscuits” (格仔餅) in Hong Kong. Although not featuring the characteristic honeycomb pattern, you may also enjoy breakfast recipes with a similar batter such as aebleskiver from Denmark or the similar poffertjes from the Netherlands. And if you’re in the mood, why not try Austrian kaiserschmarrn? The kids will love it! I made those waffles for a waffle party I hosted last weekend. I purchased a waffle maker for the occasion. Can you believe I still didn’t own one. 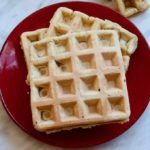 So, although this waffle maker makes round waffles, I am sharing with you the traditional recipe of Brussels waffles, which as described earlier, is a little different from the American “Belgian waffles”. We enjoyed our waffles with powdered sugar, strawberries, melted chocolate and whipped cream. No, I am not really on a diet. Let’s just say I still haven’t started any new year resolution! A waffle is a small crisp batter cake, originally from Belgium, that is traditionally baked between two iron plates with various patterns. Boil the milk and vanilla and let cool. In a bowl, combine flour, egg yolks, sugar and a pinch of salt. Add milk and melted butter and mix. Roll the egg whites until stiff. Stir the egg whites into the dough to obtain a smooth dough. Heat the waffle iron over medium-high heat or the waffle unit in medium position. Pour dough and cook each waffle 3 to 4 minutes total.